On March 30, 1943, The aircraft carrier USS Ranger was off the coast of Massachusetts heading to the Boston Navy Yard for re-fitting. 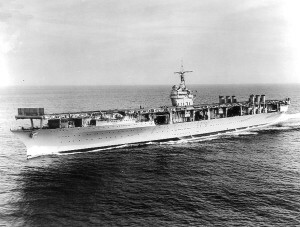 As such, the ship’s compliment of aircraft were sent inland, ultimately bound for Quonset Point Naval Air Station in Rhode Island. As the aircraft neared shore they encountered a weather system with thick cloud cover that started at 200 feet and rose all the ay to 7,000 feet. Besides zero visibility, radio communications were also affected, and the aircraft became separated. 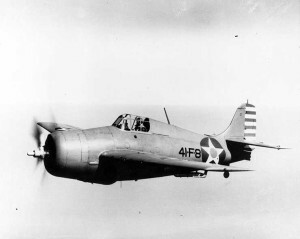 One of the aircraft, an F4F-4 Wildcat, (#12196), piloted by Lieutenant Theodore A. Grell, of VB-42, began experiencing engine trouble while over a rural portion northern Fall River. 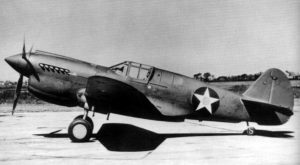 As his aircraft began to rapidly loose altitude he was forced to bail out even though he was below the recommended safe altitude for doing so. His parachute had barely opened when he landed in an apple tree and crashed through its branches, which broke his fall. 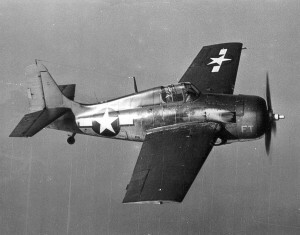 His Wildcat crashed on a farm about a half-mile away. Local residents found him the orchard and administered first aid until an ambulance arrived and took him to Trusedale Hospital. This wasn’t Lt. Grell’s first brush with death. 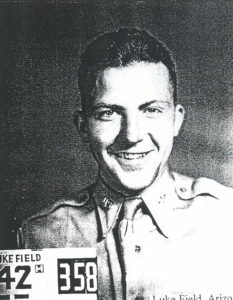 He survived being shot down over North Africa during Operation Torch in 1942. He survived the war and retired from the Navy as a Captain.